In a world of information overload, mail can boost the effectiveness of your message or product by combining the traditional values of personal communication and properly targeted material. Mail can help build brand awareness and deliver profitable, continuing client relationships. Whether you’re a seasoned professional or relative newcomer to direct mailing we can offer a comprehensive and knowledgeable client experience based on our understanding and expertise in the process. 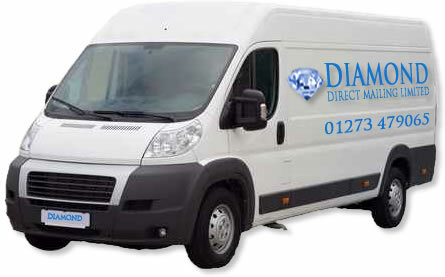 Hire Diamond Direct Mailing and we deliver: on time and on budget. Whatever service you choose from our extensive Business-2-Business range we will work with you to fulfil your marketing objectives and achieve high value on your mailing costs. Our range of services include: Machine Inserting, Data Prep/Data Management, Laser/Ink Jet printing, Royal Mail/Downstream Sortation, Hand Folding & Enclosing, Machine Folding, Hand Finishing, Personalised Matching, Labelling, Bulk Packaging, Pick & Pack, Storage & Distribution, Magazine Fulfilment, incl. Cover Mounting, Postage Stamp/Post It Note Affixing, Greeting Card Fulfilment, Glue Spot/Hot Dot Affixing, CD/DVD Fulfilment, Overseas Mailing, InkJet, Laser & Digital Printing, Mailsort, Downsteam Providers, Suppliers of Mailing Items, Envelopes of All Sizes, Plain or Overprinted, Poly Bags, Jiffy/Air-Lite Bags, Bubble Wrap, etc.